BERLIN, Germany -- Ukrainian Prime Minister Arseniy Yatsenyuk has traveled to Berlin for talks with German Chancellor Angela Merkel. 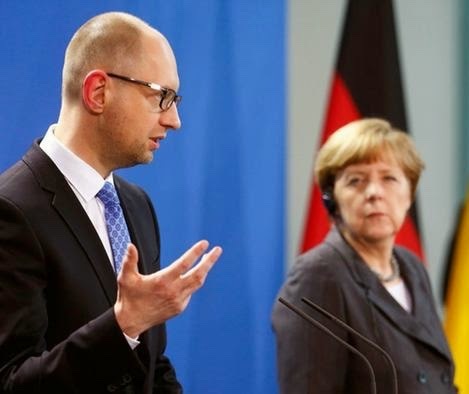 PM Arseniy Yatsenyuk in Berlin and German Chancellor Angela Merkel. There, he received encouragement from Merkel about Ukraine's path toward peace and reforms. At a joint press conference with Ukraine's visiting Prime Minister Arseniy Yatsenyuk in Berlin on Wednesday, German Chancellor Angela Merkel said the ceasefire agreement between Ukraine and pro-Russian separatists in the eastern part of the country had led to a "calmer" situation, but that the ceasefire was not yet complete. Specifically, she said the withdrawal of heavy weapons was so far insufficient. Yatsenyuk said Ukraine was complying with the ceasefire agreement reached in Minsk in February, but that "was not necessarily the case" with regard to Russia. He said 75 Ukrainian soldiers had been killed and many more injured since the February 15 agreement. "It's up to Russia to implement the only road map we have toward de-escalation of the situation and a peaceful resolution of the conflict," Yatsenyuk said. With regard to the idea of elections to be held in parts of the rebel-controlled areas in Donetsk and Luhansk in eastern Ukraine, Yatsenyuk said he was in favor of the idea because it would mean Ukraine "wouldn't be negotiating with terrorists but with a legitimately elected authority." He added, however, that is was difficult to hold an election at gunpoint. The two leaders also discussed cooperation on economic issues affecting Ukraine. Germany had previously pledged 500 million euros ($538 million) in credit to help boost the Ukrainian economy, but Wednesday Merkel said that 300 million euros of that money had been earmarked for investment in modernizing Ukraine's infrastructure, economy, and health system. Yatsenyuk said there would be opportunities for Germany to help with the implementation of infrastructure programs. Merkel pledged the support of all German ministries - from finance, economy, the foreign office to development - to help and advise Ukraine when it came to making the country "economically successful and transparent." She added that reforms involving Ukraine's fight against corruption and toward improving tax transparency had brought about conditions for more international investment. "The German economy will be prepared in the next few months to discuss with Ukraine what investment options will become available," she said.